We’re just as passionate about fall color as we are about spring wildflowers. Grabbing the baton long before most trees get the picture, we can count on bunching (clumping), ornamental grasses. Many of us jumped on the native grass bandwagon with Lindheimer muhly and Gulf muhly, since they were available, drought tolerant, and deer-resistant. Recently, we’ve fallen for (albeit hard-to-find) hybrids Pink Flamingo muhly and Muhlenbergia sericea ‘White Cloud’. Purple fountain grass (Pennisetum setaceum ‘Rubrum’), indigenous to regions of Africa, flaunts tall stature in summer. Although we can lose it in cold winters, it sticks around to pair with wispy-pink Gulf muhly. There are lots of little pennisetums, too, that fit nicely into small spaces with froths of miniature white flowers. Again, often we consider these annuals to replant in spring, depending on your microclimate. ‘Little Bunny’ is a common one. In winter, native grasses anchor the cold weather garden, even as they harbor sheltering wildlife. Cut them back in late winter as new growth emerges. Daphne explains how to grow bunching grasses. 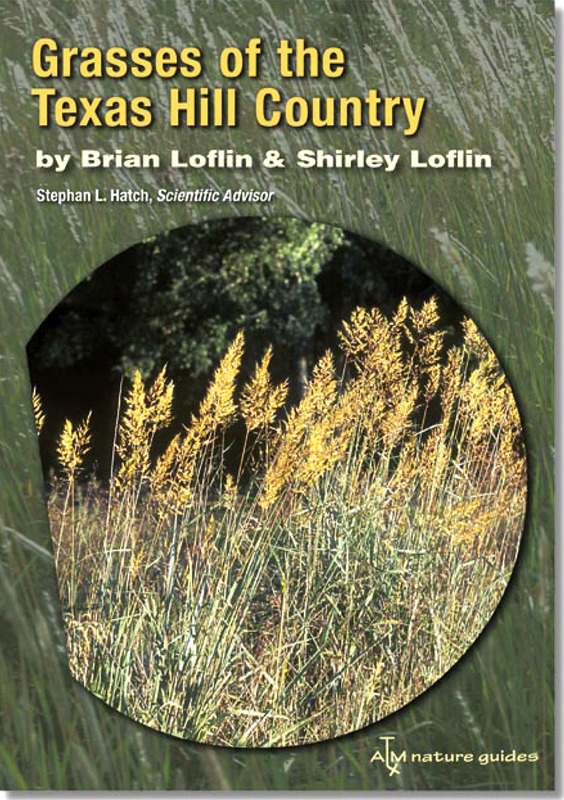 Brian and Shirley Loflin’s Grasses of the Hill Country is a great resource to identify grasses. Live oaks keep their leaves until they shed old growth in spring to make way for the new. But, for Jennifer Valdés, one of her young live oaks is bare on top. It was planted by the builder a couple of years ago, just before she and her family moved into their new home. She mulched it the dripline and waters with a bubbler. Most likely, the problem started at planting time. Daphne explains what might have happened. On patios, balconies and porches, we love to style up with succulent containers. Rather than haul everything into warmth, John has a few ideas for cold-hardy succulents in hanging baskets. John’s also got a tip for growing in coconut coir fiber containers: line with a cut-down black plastic garbage bag punched with holes for drainage. You also want to use a light-weight cactus soil mix. 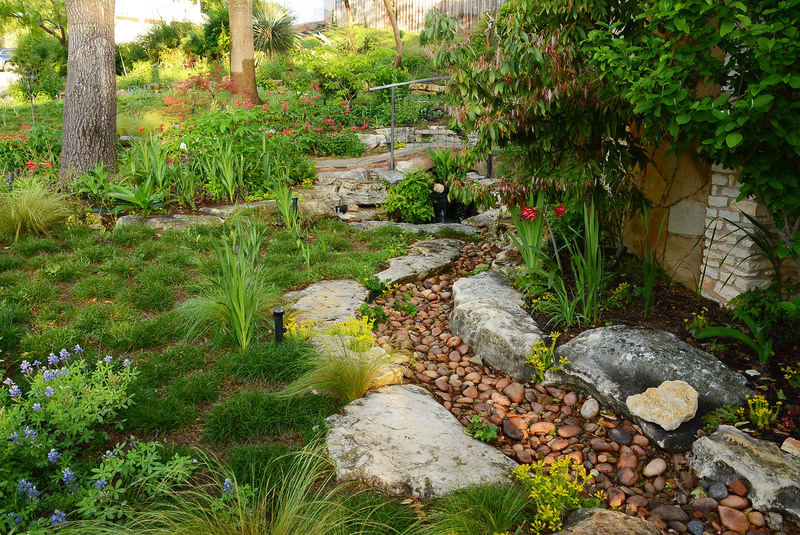 Top with expanded shale or small gravel to pretty it up and prevent soil splash. Get John’s list and watch now. A toothy, maroon dyckia tops a patio table in a garden I saw on the San Antonio Water Systems Water-Saving tour a few years ago. The Gardening Volunteers of South Texas helped organize that tour. This year, they’ve partnered with The Garden Conservancy to present the San Antonio Open Days tour on October 14. Energetic Regional Representative Shirley Fox previews the diverse designs to see on October 14. It’s a delightful collection of styles, plants, and outdoor living rooms sure to inspire your own hands-on takeaway. Plus, it is so fun to explore with fellow gardeners and share the camaraderie of idea-seekers and plant care geeks like us! Watch now. Get tickets online and maps to the gardens. Visit Shirley’s blog to explore her plant adventures at home and out and about! On our visit to one of the gardens, in the San Antonio suburb of Terrell Hills, Mary and Lewis Fisher grow awareness of the past that impacts the present and our future. Lewis, renowned for his books that tell the stories of old San Antonio, founded Maverick Publishing, named for Mary’s family. Recently purchased by Trinity University Press, he published 45 books by 27 authors. Mary serves on the boards of the San Antonio Botanical Garden Society and the Brackenridge Park Conservancy. Born into the iconic Maverick family, her early home influenced her decision to restore drought-tough natives (and adapted) plants when they took out turf grass. When they added a screened in porch to the front yard, they ripped out the traditional sidewalk in favor of stacked flagstones. At the curb, they widened the pathway with Oklahoma stone. In back, they inherited ancient oak trees and an historic wall built in the 1930s around the historic Lutcher Brown estate. To add dimension and seasonal flowering in shade, they worked with designers Scott Ogden and Patrick Kirwin to layer blooming understory trees, perennials and bulbs, along with structural succulents and evergreen groundcovers. The Fishers added the flagstone patio a few years ago. Recently, Scott and Patrick framed it with shrubs, trees, and grasses, most still growing in during their first few seasons. Mary lucked into the perfect historic touch with old light fixtures from the Olmos Dam. Mary rewired them to light the night on their own mini bridge. I sure hope you get to meet charming Mary and Lewis on October 14! In Mary, I found a kindred soul warrior to change our garden philosophy in a water-restricted future. Here’s the Ogden/Kirwin plant list additions. Watch now for Mary’s own words that express this all much better than I ever can.